Stuart Meeks spent 12 years of active duty in the Air Force working on aircraft. Once he left the military he was looking to transition into a job in aviation since he viewed it as a natural fit. 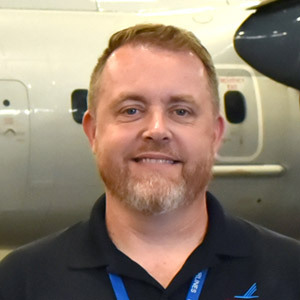 After graduation from Delaware Tech’s aviation maintenance program, Meeks’ old classmate Adam Davis recommended he apply for a job at Piedmont Airlines in Salisbury, Md. Now as the maintenance base manager for the Salisbury facility, Meeks oversees the mechanics and logistics of the base and makes sure all aircraft flights run smoothly, and is involved in some facility management. He oversees 60 mechanics and four supervisors. Meeks said he immediately took to the Aviation Maintenance program as soon as he started classes.